I've been doing a lot of wolf studies lately and I thought it'd be a fun challenge to make an illustration that focused entirely on wolves. Anatomy and reference drawings are one thing, but trying to create characters and tell a story uses a different muscle entirely. Pretty simple, implied story moment using some broad archetypes. 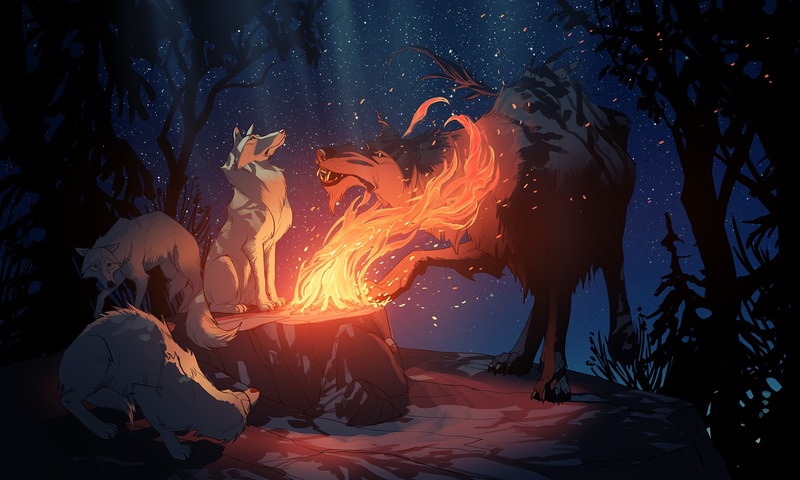 Turn out that when drawing wolves it's easy to slip into mythological territory. I was fortunate enough to attend the Syn Studios "Gathering of Masters" in Montreal. Five days of talks, workshops, and hanging out with like-minded artists from all kinds of backgrounds. It was hugely inspiring to listen to James Gurney, Terryl Whitlach, Samantha Youssef, Raphael Lacoste, and many others. I've been home for two days and I can't stop drawing. Right now I'm frantically running around drawing everything. Eventually i'll calm down and start focusing, but for now I'm like a humming bird with a pencil. There are life drawings, animal drawings, anatomy studies, and even some airplanes (picking a subject I have little to no interest in and trying to lean into it). I am currently an Art Director at Bioware. My goal is to move colors around until people feel things.